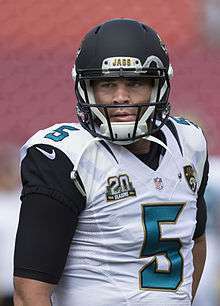 Robby Blake Bortles (born April 28, 1992) is an American football quarterback for the Jacksonville Jaguars of the National Football League (NFL). He was drafted by the Jaguars with the third overall pick in the 2014 NFL Draft, and played college football at Central Florida. Bortles was the Knights' starting quarterback from midway through the 2011 season to 2013. In 2012, he led UCF to a Conference USA East Division Championship and bowl victory. In 2013, Bortles led the Knights to an upset of then-No. 8 Louisville to win the inaugural American Athletic Conference Championship, as well as an upset victory over sixth-ranked Baylor in the 2014 Fiesta Bowl. Bortles attended Oviedo High School in Oviedo, Florida, where he excelled in football and baseball. As a senior, he completed 151 of 233 passes for 2,211 yards with 27 touchdowns and seven interceptions, finishing his career with a Seminole County record 5,576 career passing yards and 53 touchdowns. Labeled a three-star recruit by Rivals.com, Bortles was listed as the No. 44 pro-style quarterback in his class. Bortles chose UCF over offers from Colorado State, Purdue, Tulane, and Western Kentucky. Bortles accepted the offer from UCF, the first college to offer him a scholarship and one near his home. He was redshirted as a true freshman in 2010. As a redshirt freshman in 2011, he played in 10 games, completing 75 of 110 passes for 958 yards with six touchdowns and three interceptions. As a sophomore in 2012, he started all 14 games at quarterback. He completed 251 of 399 passes for 3,059 yards with 25 touchdowns and seven interceptions. He also rushed for 285 yards and scored eight touchdowns. He was the MVP of the 2012 Beef 'O' Brady's Bowl after completing 22 of 32 passes for 271 yards with three touchdowns and 79 rushing yards. In 2013, Bortles led the Knights to the inaugural championship of the American Athletic Conference, earning the league's automatic berth to a BCS bowl, the Tostitos Fiesta Bowl. Passing for 301 yards and rushing for 93 yards and four touchdowns, Bortles led UCF to an upset of fifth-ranked Baylor, 52–42. Winning UCF's first major bowl, he was named the Offensive MVP. As a starter (2012–2013), Bortles owns a 22–5 (.815) record. On January 5, 2014, Bortles announced that he would forgo his senior season and enter the 2014 NFL Draft. Bortles vs. Ravens in 2014. On May 8, 2014, at the 2014 NFL Draft, Bortles was chosen 3rd overall by the Jacksonville Jaguars. Bortles was the first of an eventual 14 quarterbacks to be drafted. On June 18, he signed his rookie contract worth $20.6 million guaranteed for four years with the team. On September 21, 2014, Bortles made his regular season debut when he came in relief of Chad Henne in the second half of a blowout loss to the Indianapolis Colts. He went on to complete 14 out of 24 passes for 223 yards, two touchdowns and two interceptions. Following the game, head coach Gus Bradley named Bortles the starter going forward. On September 28, 2014, Bortles made his first career start in a road game against the San Diego Chargers. Bortles ended the game 29–37 for 253 yards, one touchdown, and two interceptions in a 33–14 loss. His 78.4 percent completion percentage set a record for a rookie quarterback's first start. In Week 6 against the Tennessee Titans, Bortles produced 336 passing yards, however the Jaguars lost 14–16 due to a blocked field goal. In Week 13 against the New York Giants, Bortles threw for 194 yards, with one touchdown and no interceptions and 68 rushing yards in the Jaguars' largest comeback win in team history. They won 25–24 after trailing by 21 points. In Week 16, Bortles led the Jaguars to a Thursday Night Football win over the Titans, 21–13. He completed 13 out of 26 passes for one touchdown and no interceptions, with 50 yards on the ground. Bortles established himself as a dual-threat quarterback, rushing for 20 or more yards seven times in 2014, second only to Russell Wilson. Bortles, after having a strong preseason in his second year, started slow with 1 touchdown and 2 interceptions in a 20–9 loss at home against the Carolina Panthers in week 1. In week 2, Bortles led a comeback drive against the Miami Dolphins to seal their first victory of the season. He threw for 273 yards and 2 touchdowns with no interceptions. In week 5, Bortles threw for a then-career-high 4 touchdowns along with 303 yards and 21 yards rushing. However, this wasn't enough as the Tampa Bay Buccaneers won 38–31. 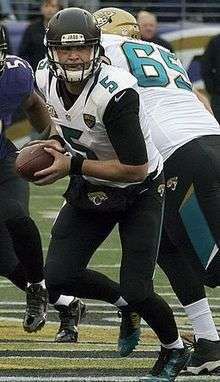 In week 13, Bortles broke the Jaguars single game record with five touchdown passes in a 42–39 loss to the Tennessee Titans. Despite the Jaguars finishing 5-11 in 2015, Bortles enjoyed a breakout season, setting the Jaguars single-season franchise records for passing touchdowns (35), passing yards, (4,428), pass completions (355), and pass attempts (606). On top of this, his passer rating only went below 80 five times in the season, in weeks 1, 6, 7, 10, and 17. He also threw a touchdown pass in the Jaguars' first 15 games of 2015, a franchise record. After finishing his 15th game, he had the second most touchdown passes in the league with 35. After throwing no touchdowns in a week 17 matchup against the Houston Texans, he had to share second place with Eli Manning, Cam Newton and Carson Palmer, behind only Tom Brady's 36. He was also seventh in the NFL in passing yards with 4,428, behind Drew Brees, Phillip Rivers, Brady, Palmer, Matt Ryan, and Manning. Bortles is the son of Rob and Suzy Bortles. Rob was a wrestler and football player in high school; Suzy played high school softball. Bortles' brother, Colby, is a third baseman with the Ole Miss baseball team as of 2015. ↑ "The Lion's Tale - Volume 50, Issue 7". Retrieved 2016-08-27. ↑ Says, Shae (2015-09-01). "Blake Bortles sure 'taint' trying to impress anyone". Specktator. Retrieved 2016-08-27. ↑ "Rivals.com pro-style quarterbacks 2010". Rivals.com. Retrieved May 10, 2014. ↑ Ryzewski, Steven (May 8, 2014). "The Bortles File: Covering Blake Bortles through the years". Seminole Chronicle. Retrieved May 10, 2014. "After turning down offers from Purdue, Colorado State and Tulane, Oviedo quarterback Blake Bortles committed to UCF on Saturday." ↑ Tenorio, Paul (August 27, 2013). "New year brings new expectations for UCF quarterback Blake Bortles". Orlando Sentinel. Retrieved May 10, 2014. ↑ Tenorio, Paul (December 21, 2012). "UCF's Blake Bortles leads Knights to 38-17 win over Ball State in bowl". Orlando Sentinel. Retrieved May 10, 2014. ↑ Gillespie, Ryan (January 2, 2014). "No. 15 UCF stuns No. 5 Baylor in Fiesta Bowl". USA Today. Retrieved May 10, 2014. ↑ "Blake Bortles Stats - UCF Knights". ESPN.com. The Walt Disney Company. Retrieved January 5, 2013. ↑ Greenspan, Dan (January 5, 2014). "Report: UCF QB Blake Bortles to declare for 2014 NFL Draft". nfl.com. Retrieved May 10, 2014. ↑ Clarke, Patrick (January 5, 2014). "Blake Bortles Will Declare for 2014 NFL Draft". Bleacher Report. Retrieved May 5, 2014. ↑ "Blake Bortles". nfl.com. Retrieved May 10, 2014. ↑ Rosenthal, Gregg (May 8, 2014). "Jacksonville Jaguars take Blake Bortles with No. 3 pick". nfl.com. Retrieved May 10, 2014. ↑ Bien, Louis (May 8, 2014). "NFL Draft results 2014: Blake Bortles goes No. 3 to Jaguars". SB Nation. Retrieved May 10, 2014. ↑ Patra, Kevin (June 18, 2014). "Blake Bortles, Jacksonville Jaguars strike contract". National Football League. Retrieved June 18, 2014. ↑ Edholm, Eric (September 21, 2014). "Jacksonville Jaguars finally turn the ball over to Blake Bortles". Yahoo Sports. Retrieved September 21, 2014. ↑ King, Peter. "DeMarco Murray, Philip Rivers lead NFL MVP race; Steve Smith Sr., more". ↑ Oehser, John (6 December 2015). "Gameday takeaways: For the defense … a disheartening day". Jaguars.com. Retrieved 9 December 2015. ↑ Oehser, John. "First off the Field: Texans 30, Jaguars 6". Jaguars.com. Retrieved 4 January 2016. ↑ "Jacksonville Jaguars Passing Single-season Leaders". Pro-Football-Reference.com. Retrieved 4 January 2016. ↑ "Jacksonville Jaguars on Twitter". Twitter.com. Retrieved 4 January 2016. ↑ "NFL Single Game Passing Touchdowns Leaders". pro-football-reference.com. Retrieved 9 December 2015. ↑ Smith, Kyle (27 December 2015). "VIDEO: Bortles sets Jaguars' record for consecutive games with a TD pass". Thescore.com. Retrieved 28 December 2015. ↑ Cousins, Jill. "BLAKE BORTLES – At home,on the field". Lake Mary Life. Retrieved May 10, 2014. ↑ Adelson, Andrea (December 30, 2014). "Blake Bortles is unknown no more". ESPN.com. Retrieved May 10, 2014. ↑ Brinson, Will (February 26, 2014). "Blake Bortles asked about girlfriend Lindsey Duke in combine interviews". CBS Sports. Retrieved May 10, 2014. Wikimedia Commons has media related to Blake Bortles.